Imagine a city with so many vehicles on the road that what seems to be a nasty traffic jam is actually a regulation red light. Now imagine the same city adding well over 700 cars to its roads every day. Now imagine the situation when the Nano hits our streets. 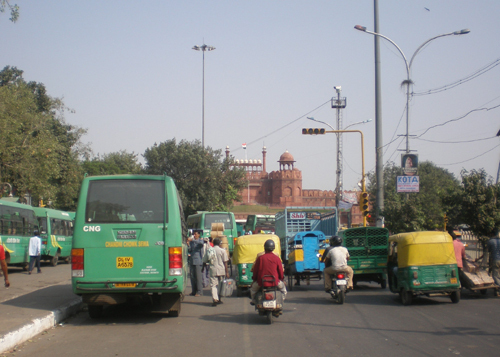 Everybody now knows that we in Delhi own more cars than the other three metros put together. The city government understands this, of course, and works to make our lives easier. But even as Delhi widens its roads, constructs flyovers and invests heavily in ensuring that citizens don’t lose faith in their cars, cities across the world are focusing on enhancing and promoting public transport. We live in a world today where everything, including development, is climate-constrained. In cities across the globe, the personal automobile is the single-largest polluter. There are significant local problems, including measurably adverse impacts on human health. The impact is most when one sits marooned in traffic, surrounded by cars with their engines idling. Imagine your commute, and how often that happens: now think just how much poison you’ve inhaled already. But surely we aren’t completely oblivious to public transport? The city takes great pride in the Delhi Metro. It’s already been declared a technological and financial success, and each successive phase has been executed well in time. But, though the Metro has been successful in connecting several parts of Delhi, it has come at a huge environmental cost. Trees had to be uprooted and the underground stretches have impacted the groundwater status in the city. Further, any structure underground is a potential hazard, especially in the event of an earthquake, and Delhi falls in a seismically active zone.But the Metro has had a further, more insidious impact on Delhi. It has been portrayed to be in direct competition with public transport on the road, particularly buses. To the average Dilliwala, the Metro is now being understood to be the only (public transport) solution to our traffic mess. This not only furthers the delusion that the Metro will pick us Dilliwalas up from our doorsteps, it also reduces confidence in an already crumbling bus transport system. Thus, while no attempt (bar the HCBS, later the BRT) was made to upgrade either the condition of the roads or the buses or the manner in which the system works, every government department was quick to declare itself part of the Metro’s success. And what of the BRT? Formerly called the High Capacity Bus System, the Bus Rapid Transit system was meant to be a low-cost and flexible mass transportation system that could reach every part of the city and could connect easily into other modes of feeder transport like cycle- and auto-rickshaws, taxis and even the Metro. However, the implementation of the BRT was carried out in a manner that suggested the authorities wanted it to fail. While the Metro was first laid in the north and eastern parts of the city and the south Delhi section is only now being laid, the BRT was – from its inception – introduced to the busiest and most active part of the city, from Ambedkar Nagar to Moolchand. And the scrutiny started even before it had a chance to actually find its feet. Crucially, the “rapid” nature of the BRT was never seen by the public. The same Blueline buses, among a few new low-floored buses, are seen plying on the road. Neither has the number of buses gone up, nor the frequency. And why? Can it possibly be that putting the Metro in place, with its huge fixed project costs, is actually cheaper than buying some new buses? It is said that transport differs from all other problems faced by developing societies, because it gets worse rather than better with economic development. A society that is truly committed to environmental equity, social justice and economic growth thus necessarily needs to get its transport policy right. The BRT was one such step in the right direction but, thus far, hasn’t been given the opportunity to show what it can do. Transport is to a city what blood circulation is to the human body. Its clogging can lead to fatal consequences, while artificial and superficial measures won’t last long. Before you buy that new car, think a while. And reconsider your relationship with the humble bus.